My relationship with cash machines is fraught at the best of times, but I think this one last night in Balham was conspiring with my bank in a deliberate ploy to make me go overdrawn! 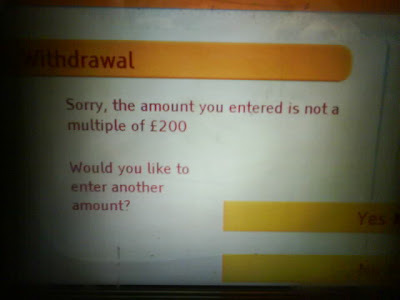 Exactly what notes was it dispensing if it could only do so in multiples of £200?! DOZENS of abandoned stations on the Underground could be opened for spooky tourist trips if a former banker's idea is given the green light. There are around 30 disused stations on the Tube network along its 255 miles of track which have closed due to lack or use or station and line relocations. They became known as "ghost stations" because they have been left in exactly the same state - except they are eerily empty and silent. Entrepreneur Ajit Chambers wants to run tours of the stations and allow visitors to walk along unused tracks. He plans to set up exhibitions of the larger-than-life characters and bizarre stories behind the development of the Underground. Aldwych/Strand on the Piccadilly line and the old Jubilee line platforms at Charing Cross are already available for use by film crews, but Chambers' company would pay for safety improvements to the 26 other stations for visits by tourists. He also wants to open 40 shelters on the network used during the Second World War. Chambers told BBC London: "I'm opening them up as a tourist adventure... you go to a small door and literally go down into something that hasn't been opened since the 1940s." The entrepreneur said he had given up a career in investment banking to sink his money into forming The Old London underground Company. Chambers says of the panel of BBC's Dragon's Den had expressed an interest in the project and at a public meeting last month, Mayor Boris Johnson said of the plan: "It is brilliant. I love it." A Transport for London spokeswoman said: "The cost of reopening the stations would be huge. We have no plans to reopen them." Hard to know where to start with something as preposterous as this, but in the first instance it's worth pointing out that around half of the 28 stations named above are surface ones, so the "Underground" element is fairly low, and in most cases there is little evidence that there was a station at all. The trackbed may widen in places, but the platforms are long-gone, whilst station buildings - if they still exist at all - have since moved onto "other duties." The most questionable inclusions on the list are the final three Central line stations, as the route covered by them (sans Blake Hall station, now a private residence) is now run as the heritage Epping Ongar Railway. When it comes to the actual below-ground stations, most are situated on lines that are still in operation, so there would be no, "walk(ing) along unused tracks." In almost all cases the platforms have been removed, the freed-up space often being used for maintenance storage, e.g. City Road, between Old Street and Angel. Most importantly, virtually none of the closed stations are the 1940s time capsules that the article suggests, since other uses for all of part/s of them were found. York Road, on the long stretch between Caledonian Road and King's Cross-St Pancras, is a a designated emergency exit, well-lit and visible from passing trains. Parts of other stations, such as City Road, are used for ventilation purposes. Having estensively researched the history of the Underground during the Second War war, most mystifying is the reference to, "40 shelters on the network," used during the conflict. A number of the above-named disused stations were repurposed as air raid shelters, but in addition most of the deep-level open stations were also designated as civilian refuges. In the vast majority of cases, however, this was merely utilising the existing working platforms that are still in use today. There were eight purpose-built deep-level shelters, each adjacent to a working station, but almost all of these are now leased to secure storage companies, making them even less accessible than parts of the Underground system proper. The only exceptions I can think of would be the former King William Street, Brompton Road, and Down Street stations. King William Street was the original terminus north of Borough on the Northern line that closed in 1900 when a new alignment running via London bridge was constructed. During the Second World War the former running tunnels north of Borough were used a public air raid shelter by the local council, while King William Street station itself was refurbished as a private shelter for the office building above it. That building was subsequently demolished, but access to this shelter is retained from the office complex that replaced it. Brompton Road and Down Street were both used by the military/government during the War, and in each case the walls blocking off the platform areas from the running tracks remain in place. Such wartime usage makes both locations very interesting, yet at the same time alterations that enabled that usage make there conversion to tourist attractions more difficult. At Brompton Road, for example, the operations room for the 1st Anti-Aircraft Division still exists, but it occupies part of the original lift shaft. Lift access would be a prerequisite, but it would be almost impossible to reinstate them without destroying this key historical feature! In conclusion, it seems to me that there are very few locations that even fit the requirements of Chambers's plans, and almost all of them would be beyond use for a variety of reasons - primarily cost - even if Transport for London saw it worth their while.